Jason Joy atop the winners' platform. 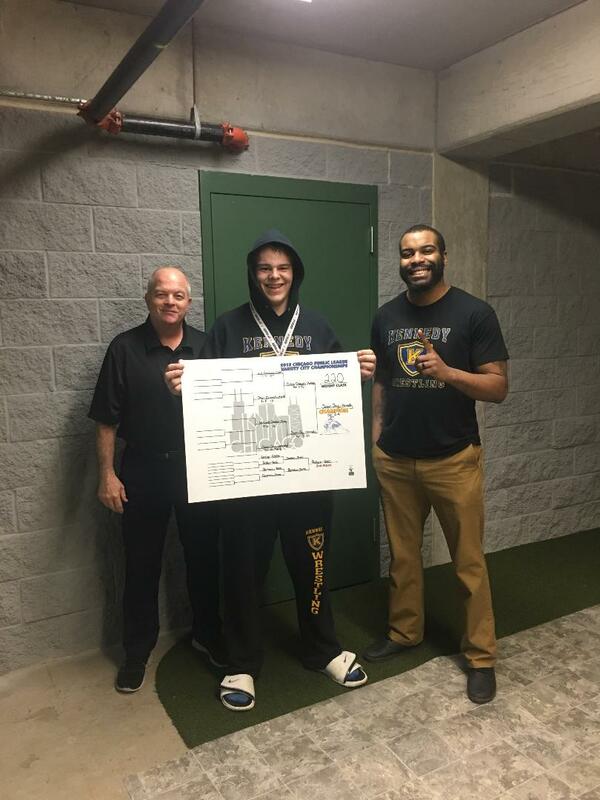 city crown last weekend after he edged a rival grappler from Mather High School, 10-9, to capture the Chicago Public Schools championship. Though the final match was described as a "nail-biter" by one of his coaches, Joy said he felt "pretty confident" throughout the struggle, as well as his earlier triumphs in the two-day tournament, held first at Back of the Yards College Prep and then at Chicago State University. Joy wrestled at 220 pounds and defeated a total of four opponents on the way to the crown. The new champ with Coaches Carroll (left) and Mosley. 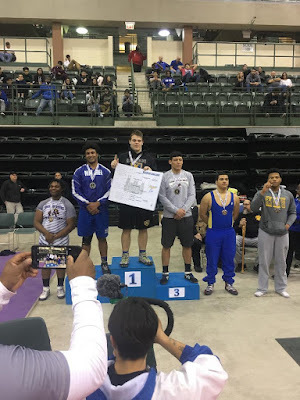 A junior at Kennedy, the Crusader wrestler started in the sport as a freshman, getting stronger and better each year, according to De Andre Mosley, a wrestling coach at the school. "He's a phenomenal kid," Mosley said. "He's one of the most dedicated athletes we have at the school--always looking to improve, as well as help his teammates." Joy, a Garfield Ridge resident and 2015 graduate of Byrne Elementary School, played basketball in grade school and plays 16-inch softball for Kennedy. As an athlete, he plans to up his game even more over the summer with weight training and wrestling, in anticipation of defending his title in the 2018-19 season--with a college career on the mats on the horizon. Joining Mosley in congratulating Joy were Kennedy coach Dan Carroll, athletic director Mario Silva, Principal George Szkapiak and others.